Ask.com (Ask, or Ask Jeeves) is a crawler-based search engine with lots and lots of cool features. Ask also is the parent company of such notable Web destinations as Ask for Kids, Bloglines, and Teoma, which is the underlying search technology for Ask's search. The Ask home page is streamlined and straightforward. But, don't let the simple interface fool you because you have a lot of search options here. In addition to the standard Web search, you can also search for images, news, maps, local search, weather, encyclopedia listings, blogs and feeds, and more. You can see all these options in the Search Tools window directly to the right of the main search bar. If you click "More", you'll get even more Ask search goodies such as Advanced Search, Bloglines, currency conversion, desktop search, mobile content, movies. This is a serious search engine user's dream come true. 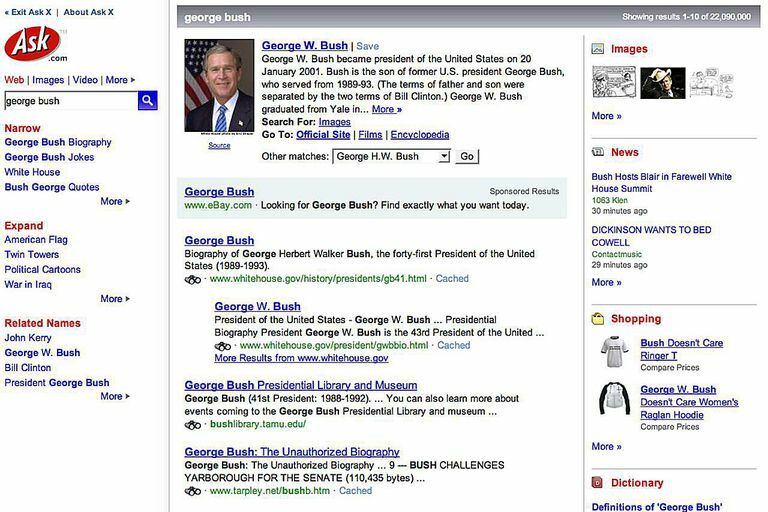 One thing that Ask.com was famous for when they first started out was the ability to search in "natural language", or in non-searchese, the ability to search in the same language that you would ask a friend, such as "am I wearing pants?" Ask doesn't promote the natural language bit as much anymore, but they still have a few searching tips that are good guidelines to keep in mind when searching with Ask. For one thing, "Ask.com's search technology responds to questions, phrases, or single word searches"; That's a tip to remember. Where can I find ford car rentals in Wyoming? Conversion Calculator: A query for "mile to yards" gets an instant answer with more suggested conversions on the far right. Dictionary: Preface the word you want to be defined with "define", "definition" or "meaning of" whatever word you want. Famous People Search: Simply type the name of whatever famous person you are searching for. A search for "Dylan Thomas" comes back with many results for both the singer and the poet. Product Search: Find products based on reviews, features, price, and store location. "Smart Answers can be found on the web results page of many searches, like for a band or famous person, and contain a brief bit of information and links to more information. You can get quick access to sports scores, movie times, weather, dictionary results, translation, conversions, and more." What's special about Smart Answers is that you're getting an instant, factual answer (no sorting through lots of extraneous results), plus, you get plenty of extra search suggestions to the right of your search query that can expand or narrow your search. What's interesting about Ask Local Search is you get lots of expand/narrow options for your search. Obviously, there's going to be a LOT of pizza places in New York City, so Ask will give you a drop-down menu with some specific neighborhoods and boroughs to look at. Each search result comes with tons of information such as map, directions, website, price, and even the hours. You can also sort your results by relevance, distance, or ratings. Plus, you can click on any of the numbers on the interactive map and be taken instantly to the corresponding website for that destination. Just for clarity's sake, it would be nice to have the name of the destination popup when you wave your mouse over the points on the interactive map. If you'd like to learn more information about a specific blog, simply type the name of the blog - no need for a complete URL. The search results show the latest posts, and you can click through for more information.